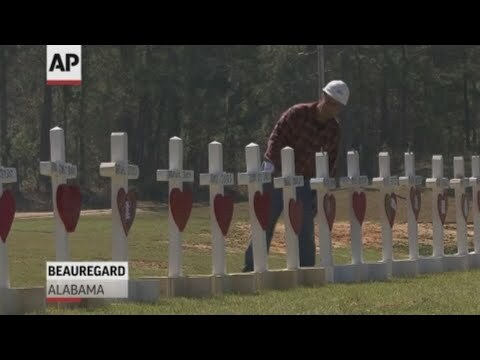 BEAUREGARD, Ala. (AP) — Alabama’s governor walked a country road lined with shattered mobile homes Wednesday as the search for victims of a monstrous tornado ended and residents salvaged what they could from the rubble and planned funerals for the 23 dead. Brooke Waldrop searched for the beloved motorcycle vest of her late stepfather, Marshall Grimes, who had belonged to a Christian motorcycle club. “Words cannot express how much this man loved God and he loved his motorcycles,” Waldrop said. 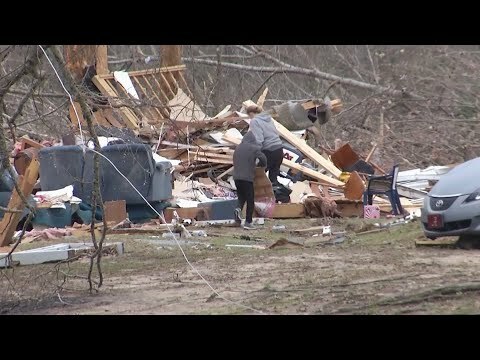 Grimes was among three people killed in the tornado-flattened home. Waldrop said her 11-year-old sister Kayla was the only person inside who lived. Waldrop said someone found the vest and brought it to the funeral home Wednesday night. She hopes to put it in a shadow box and give it to her sister as a memento. “For her to be the sole survivor of this one house is going to be hard for her,” Waldrop said. The death toll stood at 23 as officials announced Wednesday that the search for victims had ended after two full days. Lee County Sheriff Jay Jones said the final seven people on officials’ list of the missing had been accounted for and were alive. “We are still in standby mode on the outside chance they find somebody else, which is not likely,” County Coroner Bill Harris told a news conference. “My husband had grabbed me and we flew about 20 to 25 feet (6 to 8 meters) before we landed on the ground,” she said. “Typically, in the Southern plains of the U.S. in what they call the traditional tornado alley, that would be a fast forward speed,” said Chris Darden, meteorologist in charge of the weather service’s Birmingham office. “Our storms tend to move faster,” Darden said of the Southeast tornadoes.